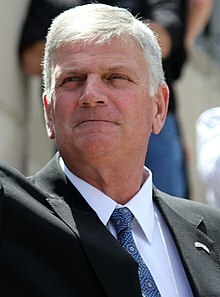 “Now Franklin Graham is inviting evangelical Christians to wear their support for Donald Trump, America`s 45th president. The North Carolina-based evangelist is selling “Pray for 45” T-shirts in the store at Charlotte`s Billy Graham Library. Televangelists` stock-in-trade is selling ridiculous religious trinkets such as prayer cloths and anointing oil to their gullible followers. Not to be outdone by his evangelical brethren, the Rev. Franklin Graham is selling “Pray for 45” T-shirts in the store at Charlotte`s Billy Graham Library. Billy Graham must be rolling over in his grave at the idea of a T-shirt supporting a president who resembles the anti-Christ more than Jesus Christ being sold in a library named after him. To add insult to injury the online ad for the profane T-shirts includes a pitch from the Bible. Many sincere Christians pray for Trump regularly, they pray that he will turn from his wicked ways and embrace God. White evangelicals, on the other hand, pray that God will bless the most corrupt, racist and inept administration in history. The store at the Billy Graham library should sell KKK pointy caps and dunce hats, they would go perfectly with the pro-Trump T-shirts.